Lamar Tower ... high-profile development currently under way in Jeddah. RIGHT: An artist’s perspective of the project. Lamar Tower ... high-profile development currently under way in Jeddah. INSET: An artist’s perspective of the project. Jeddah’s ambitions to upgrade its infrastructure coupled with key commercial and residential developments together spell busy times for the city’s builders. DHUSHYANTHI RAVI reports. Jeddah is poised to witness a major transformation over the next few years. Undoubtedly, with the completion of what is expected to be the world’s tallest tower – the kilometre-plus-high Kingdom Tower – in the next four years, Saudi Arabia’s second largest city will come under increasing pressure to push ahead with its ambitious plans such as the $12-billion Jeddah Public Transport Programme (JPTP) and spearhead a facelift of the older parts of the city. A business hub and one of the major cultural destinations in the country, the Red Sea coastal city has been focusing on developing and upgrading its infrastructure. For instance, the government has been exerting efforts to strengthen its transport infrastructure, with some of the key projects under way including the $7.2-billion expansion of the King Abdul Aziz International Airport. The expansion of the airport, which is expected to see completion by the end of next year, is the largest scheme under way in the aviation sector and one of the largest construction projects in the country. It is set to increase capacity of the airport to more than 30 million per year. Spanning an area of 670,000 sq m, it will have two new terminals for domestic and international passengers. Jeddah, which is the main gateway for the millions of Hajj pilgrims visiting Saudi Arabia each year, will also be connected via a high-speed railway to Islam’s holiest cities of Makkah and Madinah when the $9.3-billion Haramain High-Speed Railway becomes fully operational next year. The 450-km railway — first of its kind in the kingdom and linking Makkah, Madinah and Jeddah including Rabigh – is expected to reduce the travel time between the two holy cities to less than two hours and between Jeddah and Makkah to 30 minutes. Meanwhile, a key project in Jeddah’s JPTP plan is the city’s metro, which is in the early design stages and is scheduled to be operational by 2022. In July, public transport project promoter Metro Jeddah Company invited initial expressions of interest for the civil works contract for the metro network, prequalification for a separate contract to design and build its planned light rail and tram lines, and the provision of overall project management services. The metro project will include four lines and involve extensive tunnelling. It will total 39 km of double-track, with around 43 stations and 65 trainsets. The double-track corniche tramway would run 16 km along the coast, with 15 stops and a fleet of around 11 trams. The masterplan also includes local bus and bus rapid transit services, ferries and water taxis, and a suspension bridge over Obhur Creek. Metro Jeddah Company has received prequalification bids for the contract to build the Obhur Creek crossing scheme. The crossing, which will be 380 m long and 74.5 m wide, will have eight lanes for road traffic, a single railway line and two pedestrian walkways. The preliminary design was prepared by US-based consultancy Figg. The US’ Aecom has provided programme management services on the project. Earlier this year, the UK’s Foster+Partners was awarded a $80-million contract to establish a city-wide transportation planning contract for Jeddah that integrates different modes of transportation, including metro, ferry and bus. As part of efforts to give key areas of Jeddah a facelift, some 54 neighbourhoods of the city will be renovated, says a Saudi Gazette report. The municipality has already razed 720 buildings, said the source quoted by the report. The old industrial area north of Jeddah will also be renovated. “A new industrial area has been developed in Asfan, but the old area is in extremely poor condition,” he said. Last December, Jeddah Municipality announced plans to construct three new cities in a bid to enhance the aesthetics and strike a balance in the demographics of the kingdom. The cities – one residential, the second recreational, and the third industrial – are planned around Gulf Salman, Al Aslaa Valley, and Asfan city, Jeddah Municipality spokesman Mohammad Al Bugamy said. He added that the municipality is co-operating with Jeddah Development and Urban Regeneration Company to develop the infrastructure of these cities. Gulf Salman’s coastal residential project, which is designed to offer 25,000 housing units, is aimed to provide a solution for the residential problem in the kingdom. It will include educational, religious, health, sports, recreational, and general services facilities covering an area of 3 million sq m, according to Al Bugamy. Some 52 per cent of the area has been allocated for residential use, 11 per cent of the area for commercial buildings, and 37 per cent for roads, open area, recreational facilities, parks, and parking lots. Al Aslaa Valley Project will spread 130 million sq m in east Jeddah and offer recreational, education, health, and sports facilities, parks and natural reserves. The first phase of the 5-million-sq-m Asfan industrial city project is almost complete. It will have 2,095 industrial facilities, 183 warehouses for various materials, 22 factories, in addition to 385 stores and showrooms. The focus of attention is certainly on the $1.2-billion Kingdom Tower, which last month reached its 24th level of construction on its way to attaining the title of the world’s tallest tower (see separate report). The Kingdom Tower will have a gross floor area of 245,000 sq m and include offices, a 200-room Four Seasons Hotel, 121 serviced apartments and 360 residential apartments. The soaring super-skyscraper will be the centrepiece of Kingdom City, also designed by Adrian Smith and Gordon Gill Architecture (AS+GG). Jeddah Economic Company (JEC) is investing SR8.7 billion ($2.3 billion) in the Kingdom City project, which includes Kingdom Tower and Saudi Arabia’s largest shopping mall. The buildings encircling the Kingdom Tower will rise from 20 (for those nearest) to 60 storeys. Among the key new projects in Jeddah’s luxury property segment is Emaar Residences, sales of which were launched last month (November) by its developer Emaar Middle East, the Saudi subsidiary of Dubai-based global property developer Emaar Properties. The project is located in the heart of the 413,000-sq-m Jeddah Gate, its flagship master-planned development that is now a thriving lifestyle destination. The three-tower Emaar Residences is the third residential project launched by Emaar Middle East. It features 283 residential units ranging from one- to four-bedroom apartments and penthouses (upper villas). The spacious residences range in sizes from 70 to 300 sq m.
Emaar Residences follows the launches of Abraj Al Hilal One and Abraj Al Hilal Two residential projects at Jeddah Gate. While homes in Abraj Al Hilal One have been handed over, Abraj Al Hilal Two is under construction. 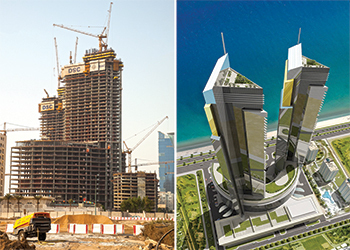 Emaar Square, the commercial business precinct in Jeddah Gate, is also under construction. Jeddah Gate spreads over 413,000 sq m and is strategically located at the new city centre along King Abdullah Road, in close proximity to the central business district, corniche, hospitals, schools and the new transportation centre (Metro Al Montalaq). Meanwhile, work on the much-delayed Lamar Towers has made headway with the recent award of a contract for the challenging façade works on the SR1.73-billion ($461 million) iconic towers. The SR200-million ($53 million) contract for the building envelope works will be undertaken by the UAE-based Technical Glass and Aluminium Company. The landscaping works is set to begin in early 2016. Among other projects, Jeddah’s largest shopping Red Sea Mall is being expanded at a cost of $53.3 million. The expansion will add around 145,000 sq m of gross leasable area (GLA) to the mall by the end of next year. As Saudi Arabia develops and expands its tourism industry, increasing investments are being made in the high-end and luxury hotel sector, including development of more holiday-focused resorts along the Red Sea coastline, and several of the top global hotel groups are expanding their presence in the country, according to a report by Business Monitor International (BMI). Total hotel construction across the country is strong, with an estimated 78 hotels at either the under-construction, or pre-opened stages across the country of which up to 42 are classified as five-star accommodation. Jeddah has enjoyed a similar vein of investment pattern as Riyadh, with an emphasis on high-quality, high-end hotel properties, the report said. Of the 27 properties under construction or in pre-opening stages in Jeddah, only one hotel is classified as three-star, with 11 four-star properties under way and 16 five-star hotels in total, showing that the upper end of the market is well catered for, it added. Jeddah recorded the highest hotel occupancy rate in September this year, leading the Mena (Middle East and North Africa) region at 84 per cent, followed by Madinah (Saudi Arabia) at 72 per cent and Dubai (UAE) at 68 per cent, said the EY ME Hotel Benchmark Survey Report for September 2015. The surge in occupancy rates can be attributed to the pilgrims who visit Saudi Arabia during Hajj as reports showed visitor numbers to Jeddah and Madinah increase before and after Hajj, it said. Some major hotel projects coming up in Jeddah include Shangri-La Hotel, Jeddah. Shangri-La International Hotel Management and Assila Investments last month signed a contract for the management and operation of the 236-room hotel and serviced residences development. Slated to open in early 2018, it will be the first Shangri-La in Saudi Arabia. The hotel will be housed in the prominent 65-storey Sail Tower located on Jeddah Corniche Road facing the Red Sea. The group will also manage and provide services to the 122 apartments that range from two-bedroom apartments to the top floor penthouse. The building’s dramatic design was executed by global architecture and design firm Perkins+Will. Jeddah will also be home to Adaigo aparthotels following a strategic management deal by AccorHotels with Saudi Arabian conglomerate Alesayi Group to develop 15 new aparthotels in the kingdom over the next five years. Four of the Adagio aparthotel projects have already been agreed upon and will be developed in Jeddah, Riyadh, Madinah and Jizan, with construction of the first hotel expected to start by the end of this year. • Some 11,000 homes are expected to be built in Jeddah and Dammam as a part of the third phase of the housing ministry’s partnership programme with the private sector to build residential projects in the country. • The $96.5-million, 500-bed King Abdullah Medical Complex in north Jeddah is scheduled to be completed by the end of this year. • The General Authority of Civil Aviation (GACA) will be constructing a new building for national carrier Saudi Arabian Airlines (Saudia) at a cost of SR350 million ($93.2 million) in the support area at Jeddah airport. The new facility will be ready by mid-2017.